Andhra Pradesh irrigation department created history by completing the Pattiseema lift irrigation scheme on the Godavari River in less than a year. Andhra Pradesh Chief Minsiter dedicated the project to the people of the state after completing inspection at Pattisam village of Polavaram mandal in West Godavari. Earlier, the foundation for the project was laid on March 29, 2015. Nearly nine TMC ft of water including 4.5 TMC ft of water from the Tadipudi lift scheme, was diverted to Krishna delta and crops worth about Rs 2,500 crore were saved. 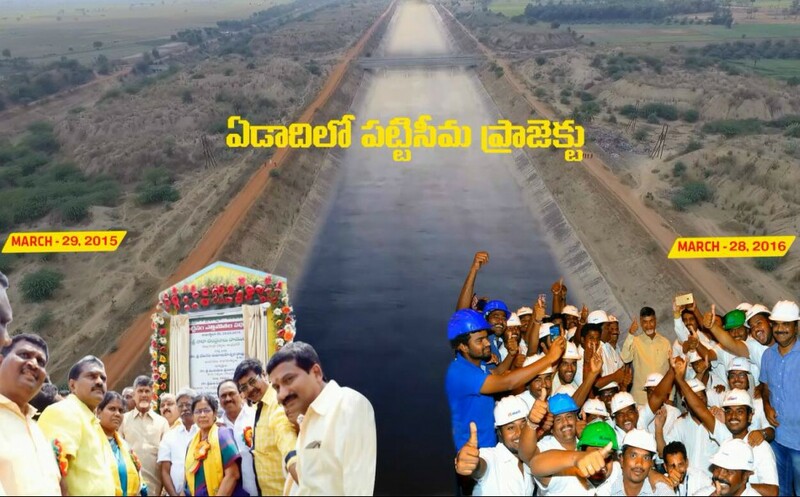 “Pattiseema project facilitate inter-linking of two major rivers, Godavari and Krishna. Some people expressed doubts when we said in the Assembly that the project will be completed in a year and they also vowed to quit politics if it happened. I must say this should be a lesson to them. I have visited the project site nine times so far,” Chief Minister said.